Austrian Marcel Hirscher clears a gate during the first run of the men's giant slalom race, Feb. 18, 2018. He went on to win the gold medal. The XXIII Olympic Winter Games in Pyeongchang, South Korea, ended Feb. 25, 2018. 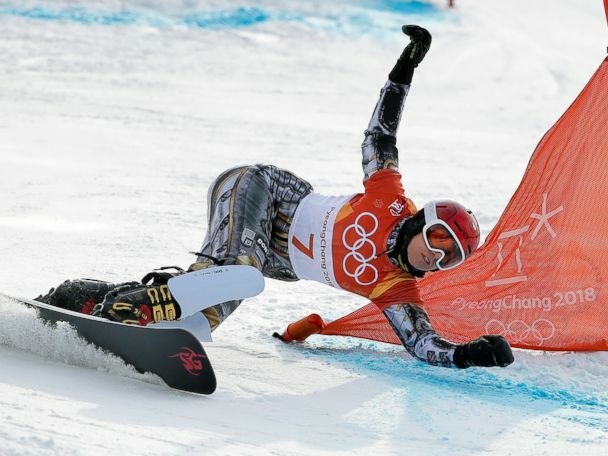 Here are some of the best photographs from the 16 days of the Winter Games. <br> <br> American's Kendall Coyne, left, and Hilary Knight hold their gold medals and the US flag as they skate on the ice after the medal ceremony. The U.S. women's hockey team defeated Canada for the gold medal 3-2, Feb. 22, 2018. American Lindsey Vonn, right, is consoled at the finish during the ladies Super-G alpine skiing event, Feb. 17, 2018. Vonn, who was considered the favorite for the gold medal, finished in sixth place. American Mikaela Shiffrin closes her eyes as she concentrates before entering the starting gate to begin a run at the Alpine skiing women's downhill training run, Feb. 18, 2018. Chloe Kim of the U.S., on her way to winning a gold medal during the women's snowboard halfpipe final at Phoenix Snow Park during the 2018 Winter Olympic Games, Feb. 13, 2018. She scored a 98.25. Shaun White of the U.S., during the victory ceremony for the snowboard men's halfpipe final, Feb. 14, 2018. White won his third gold medal this morning in Pyeongchang, South Korea, to add to medals he won in 2006 in Italy and 2010 in Canada. Pierre Vaultier of France, in red, leads Jarryd Hughes, right, of Australia and Regino Hernandez of Spain in the men's snowboard cross big final at the Bokwang Phoenix Park, Feb. 15, 2018. Vaultier won the gold medal, Hughes the silver and Hernandez the bronze. Alina Zagitova during her performance in the ladies single free skating program in which she won the gold medal, Feb. 23, 2018. Spain's Sara Hurtado and Kirill Khaliavin performing their routine in the figure skating ice dance free dance competition, Feb. 20, 2018. Adam Rippon of the United States competes in the figure skating team event/men's single free skating on day three of the 2018 Winter Olympic Games, Feb. 12, 2018. Japan's Yuzuru Hanyu performing his routine in the figure skating men's single skating free skating event, Feb. 17, 2018. Hanyu won the gold medal for this event, and became the 1000th medal event winner in the history of the Olympic Winter Games. Members of the Canadian figure skating team that won the gold medal in the team event/ice dance free dance jump in celebration during the medals ceremony at the 2018 Winter Olympics, Feb. 12, 2018. Ryoyu Kobayashi of Japan soars through the air during the Ski Jumping men's large hill individual qualification at Alpensia Ski Jumping Center, Feb. 16, 2018. Gold medal winner Jamie Anderson of the U.S. celebrates her win in the women's snowboard slopestyle final run at the Bokwang Phoenix Park during 2018 Winter Olympic Games, Feb. 12, 2018. Tobias Arlt and Tobias Wendl of Germany celebrate their gold medal-winning run during the men's doubles luge final, Feb. 14, 2018. The Korean bobsleigh team of Kim Yoo-ran and Kim Min-seong as they made their way down the track during the women's heat 1 session, Feb. 20, 2018. Lizzy Yarnold of Britain reacts at the end of her run, which won her the gold medal, in the Skeleton women's finals, Feb. 17, 2018. Speedskaters Kim Boutin of Canada, Yara van Kerkhof of the Netherlands, and Elise Christie of Britain stretch to get the front tips of their skates over the finish line in the ladies' 500 meters short track semifinal event in the Gangneung Ice Arena, Feb. 13, 2018. Seo Yira of South Korea, rear, and Han Tianyu of China, crash during the Men's Short Track Speed Skating 500 meter competition at the Gangneung Ice Arena, Feb. 22, 2018. The Netherlands' Jorien Ter Mors, rear, inserting herself into the background as the pair of silver medalist Nao Kodaira, right and bronze medalist Miho Takagi, both of Japan were photographed during the victory ceremony for the ladies' 1000-meter speed skating event, Feb. 14, 2018. Oleksandr Abramenko of the Ukraine on his way to winning the gold medal in the freestyle skiing men's aerials final at Phoenix Snow Park, Feb. 18, 2018. American David Wise reaches down to pick up his son, Malachi, after winning the gold medal in the freestyle skiing men's ski halfpipe final, Feb. 22, 2018. American Jessica Diggins, left, reacts as she crosses the finish line ahead of Stina Nilsson, right, of Sweden in the cross country ladies' team sprint free final, Feb. 21,2018. The victory gave the American team of Diggins and Kikkan Randall a gold medal. American Maddie Bowman competes in the women's ski halfpipe qualification event at Phoenix Park, Feb. 19, 2018. Joel Gilser of Switzerland crashes during his run in the men's freestyle skiing ski halfpipe qualifications, Feb. 20, 2018. Switzerland's Marc Bischofberger, Canadian Brady Leman, Switzerlands Armin Niederer and Slovenia's Filip Flisar come over the final jump in the semifinals of the freestyle skiing men's ski cross, Feb. 21, 2018. Leman went on to win the gold medal in the final run. Kaitlyn Lawes and John Morris of team Canada, left, stand over their stones while playing in the curling mixed doubles final against Jenny Perret and Martin Rios of Switzerland, Feb. 13, 2018. The Canadians took the gold medal. Sweden's Sofia Mabergs' tattoos are seen during the curling women's round-robin session between Switzerland and Sweden, Feb. 17, 2018. American Jocelyne Lamoureux-Davidson, left, scores the game-winning goal against Canadian goalie Shannon Szabados during the penalty shootout in the women's gold medal hockey game, Feb. 22, 2018. USA beat Canada, 3-2. Canadian Jocelyne Larocque, center, removed her silver medal after it was placed around her neck, choosing not to wear it during the medal ceremony after Canada lost to the U.S. in the women's gold medal ice hockey game, Feb. 22, 2018. The German team consisting of gold medalist Johannes Rydzek, silver medalist Fabian Riessle and bronze medalist Eric Frenzel celebrating at the finish line after competing in the Nordic combined men's individual 10 km final, Feb. 20, 2018. Jarl Magnus Riiber of Norway, who finished 4th, is seen in the background. American John Shuster celebrates a point during the curling men's gold medal game between the USA and Sweden, Feb. 24, 2018. The U.S. defeated Sweden 10-7. Somehow, Ester Ledecka, of the Czech Republic kept her balance during her run in the women's parallel giant slalom final,Feb. 24, 2018. 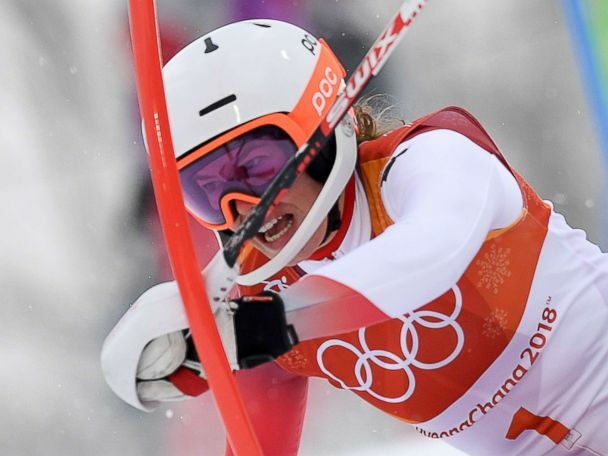 Ledecka, made history today in winning gold medals in both this event and the women's super-G alpine skiing event held earlier. Fog was descending on the Alpensia cross country ski centre when Denmark's Martin Moeller crossed the finish line in the men's 50 km cross country mass start classic, Feb. 24, 2018. Moeller came in last place with a time of 2:36:10.8. Members of the Olympic Athlete from Russia men's hockey team sing the Russian national anthem after they were presented with gold medals. They defeated Germany, 4-3, Feb. 25, 2018. Silver medalist Kevin Kuske of Germany, left, congratulates gold medalist Francesco Friedrich after the men's 4-man bobsleigh competition, Feb. 25, 2018. Agnes Knochenhauer of Sweden and her teammates celebrate their gold medal victory over South Korea in the women's curling final, Feb. 25, 2018. Artists perform during the closing ceremony of the 2018 Winter Olympics in Pyeongchang, South Korea, Feb. 25,2018. Mayor of Pyeongchang Sim Jae-guk,left, President of the IOC Thomas Bach, center, and Mayor of Beijing Chen Jining participate in the Olympic flag handover ceremony during the closing ceremony of the 2018 Winter Olympic Game, Feb. 25, 2018. The 2022 Winter Olympics will be held in Beijing, China.